LHQ Gallery,Cork County Council Library Headquarters, County Hall, Carrigrohane Road, Cork, Ireland, March 2016. 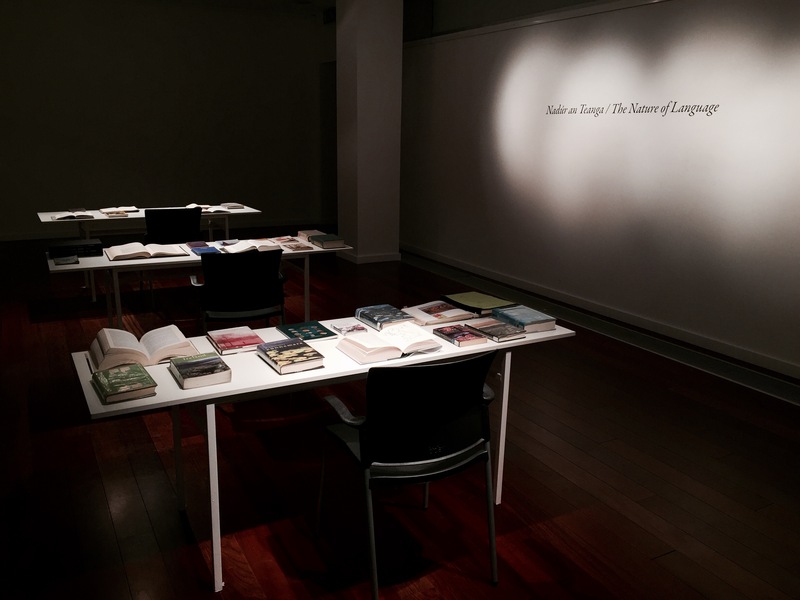 Nadúr an Teanga / The Nature of Language was an installation for Seachtain na Gaeilge that built upon research the artist undertook for her book The Water Glossary. Influenced by the work of academic and writer Robert MacFarlane, who in his book Landmarks celebrates the power of language to shape our sense of the world, The Water Glossary addresses the complex interrelations of landscape and language. 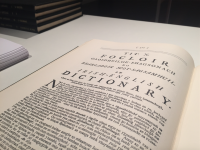 Over time and through myriad languages and dialects, an “astonishing lexis for landscape” has developed and, in turn, formed our identity and understanding of the nature of being. However, the diminishing use of nature-related words has become indicative of the relationship we now have with landscape; our vocabulary, designed to accurately and richly define the intricacies of our natural environment, is succumbing to homogenisation. 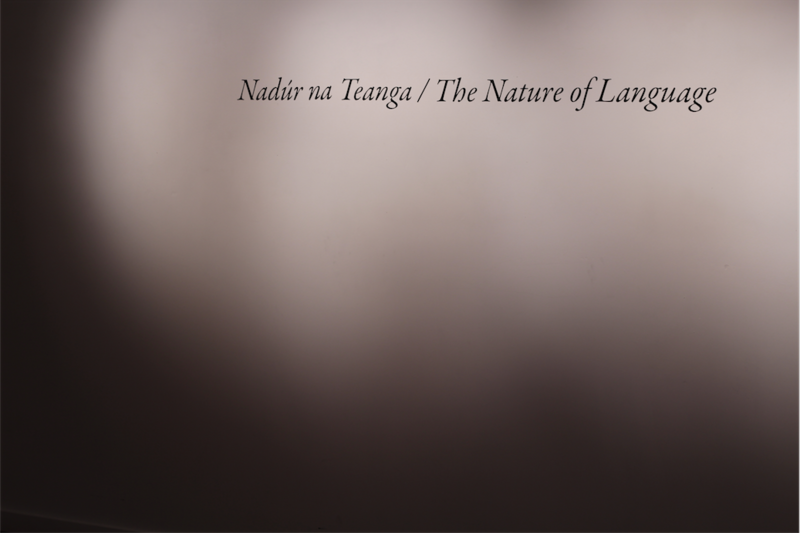 Language, both culturally and ecologically, is a fundamental means of connection and of understanding, so when there is a shift in the way we describe landscape, there ultimately is a change in our relation to it. 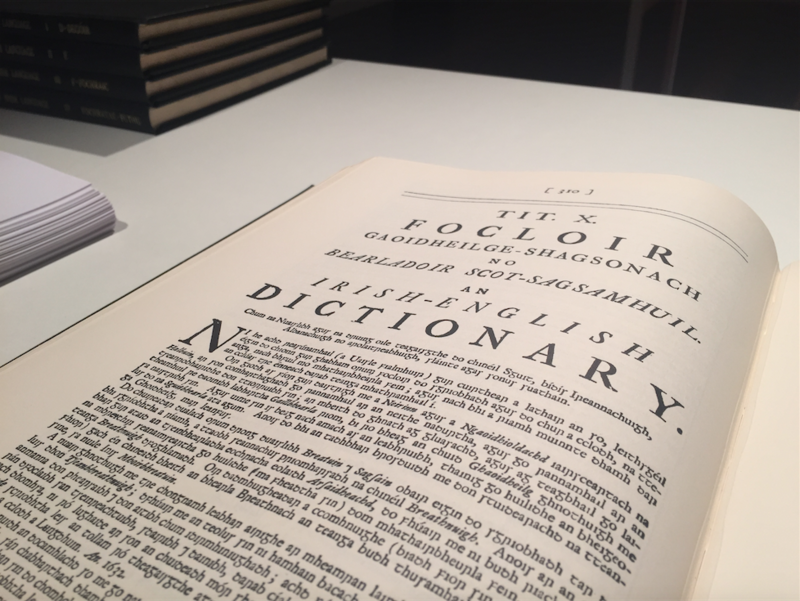 The Water Glossary aims to counteract this lexical dissolution by forging, in the Irish language, a collection of words related to this most prevalent element. 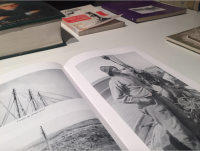 Water, as well as being embedded in our cultural, geographical, and mythical psyche, perennially plays, on both local and global levels, a preeminent role in today’s political and environmental discourse. The Irish lexicon illustrates how the language of this island’s dwellers shaped their notion of place, their knowledge of the environment and climactic nuance, by providing a vocabulary profuse in imagery and suggestive of keen observation and understanding. 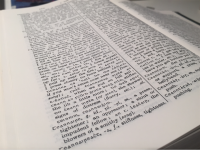 The Water Glossary essentially re-produces a descriptive landscape, layered with words that have been sourced from old texts and drawn from a diverse range of people, including fishermen, farmers, weather forecasters, scholars and poets. 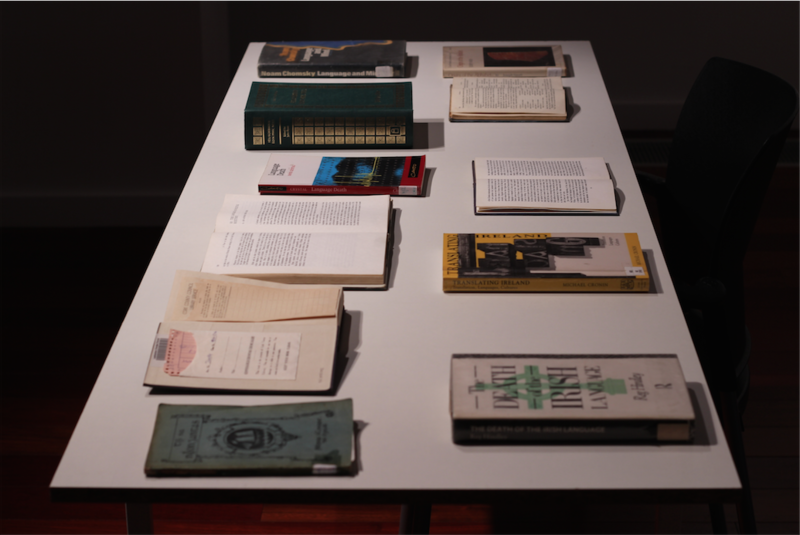 Located in the library building, the installation Nadúr an Teanga / The Nature of Language extended the library by transforming the LHQ gallery space into the form of a reading room. 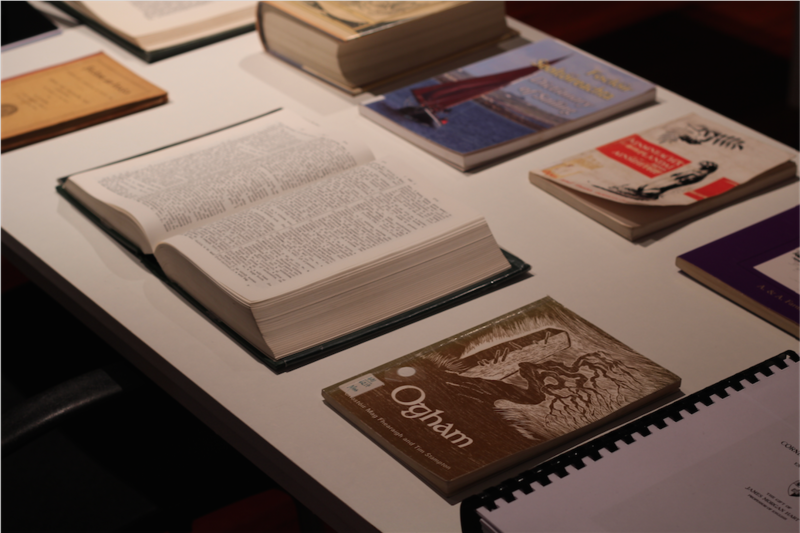 A study through the written word, the installation tracks the development of the cultural and imaginative impact of Irish language upon us, presenting its rich history and demonstrating how our relationship with the landscape has been developed through language and our understanding of it. 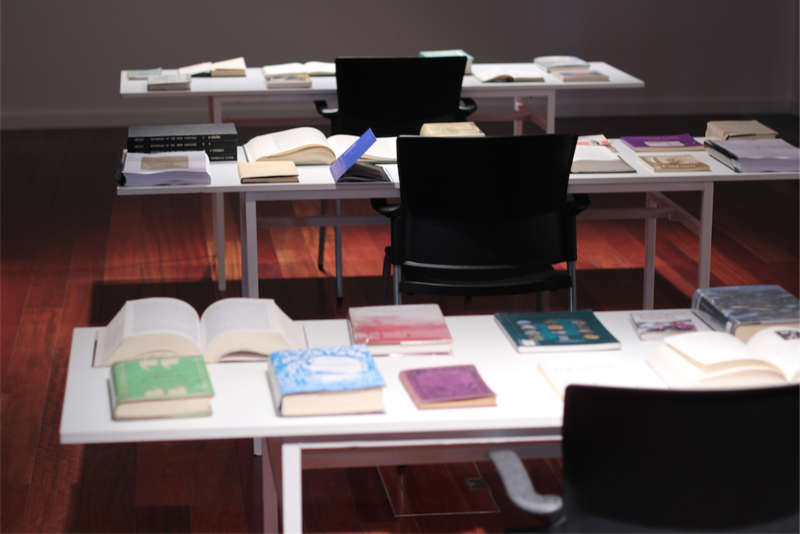 Here writings central to The Water Glossary's production are presented. 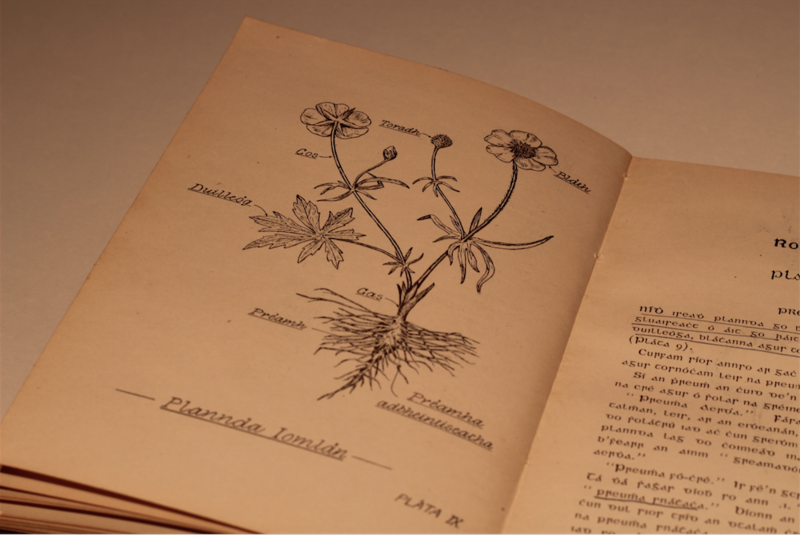 The artist worked with Cork County Arts Service and County Library staff, accessing their library collection to source books, spanning 300 years, from their collection. 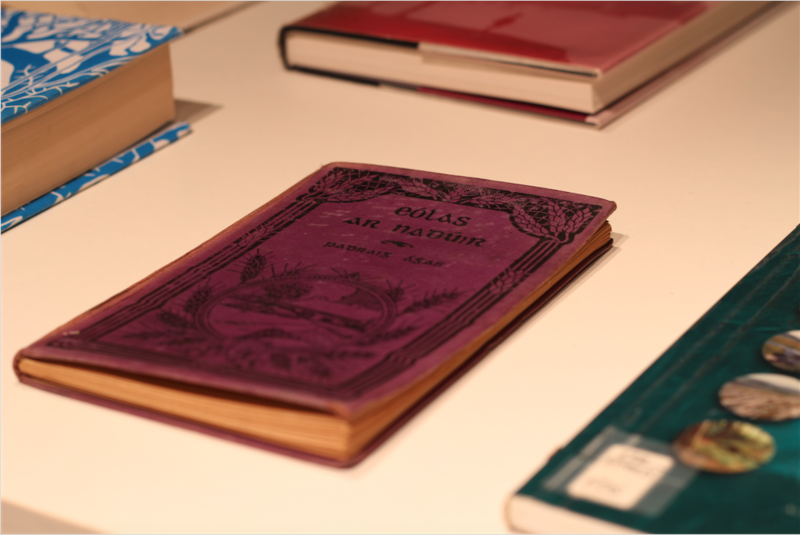 Texts presented include a range of Irish language dictionaries and writing related to language theory and nature writing.